Which race was being depicted in the painting? What were possible locations for this scene? Round Swamp Road on to Manetto Hill Road (now Old Bethpage Road). Who did Peter Helck give this painting to and why? 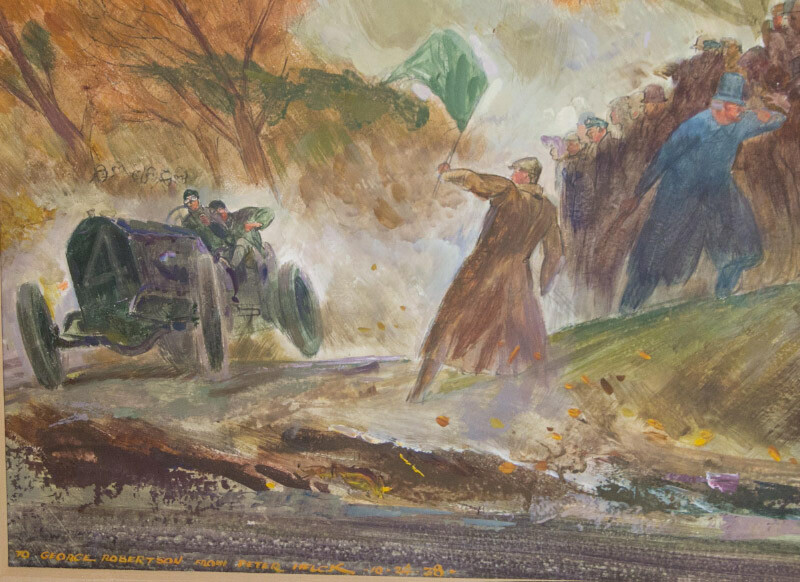 As indicated in the lower left section, Peter Helck gave this painting to George Robertson, the winning driver for the 1908 Vanderbilt Cup Race, on October 24, 1938, the 30th anniversary of his victory. Jerry Helck, the son of Peter Helck, has told me that this painting was important for his father's career. Can you explain why? This painting was used as part of the Peter Helck's successful pitch to Esquire for his 1944 series of paintings in the magazine. 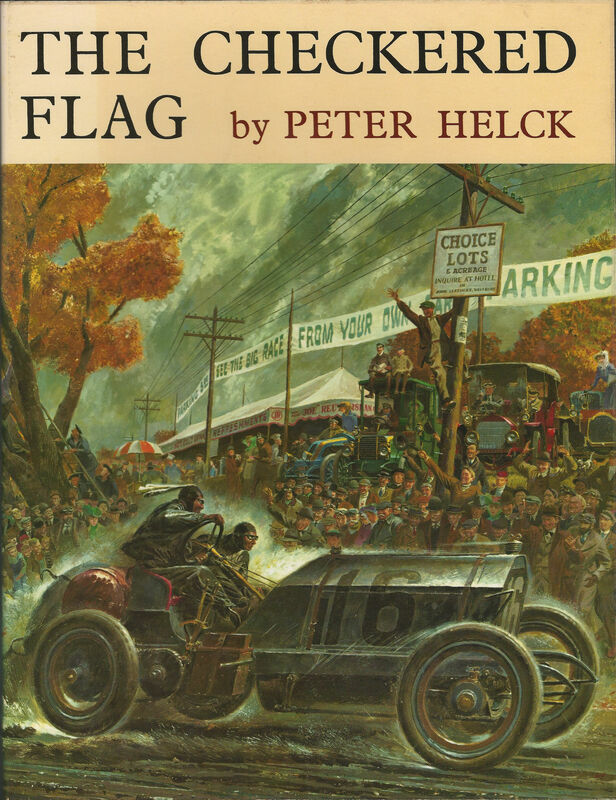 Moreover, it served as a preliminary painting for Helck's "Robertson Comes Through" which was featured on the cover of his book "The Checkered Flag." Jerry Helck: "There are references to this particular painting, including Peter Heck's request that George Robertson make it available to the Art Director at Esquire as part of his campaign to persuade them to do the series. In another letter he acknowledges that it was further development of this painting that became ROBERTSON COMES THROUGH, no surprise." Lower left corner: "To George Robertson From Peter Helck 10-24-1908"
Chuck Rudy, Jr.: "Here is the similar piece I was referencing…..happens to be on eBay. The angle is similar, but the detail appears greater in this photo with a different pursuer." Hats off to the New York Mets for an outstanding thrilling season. 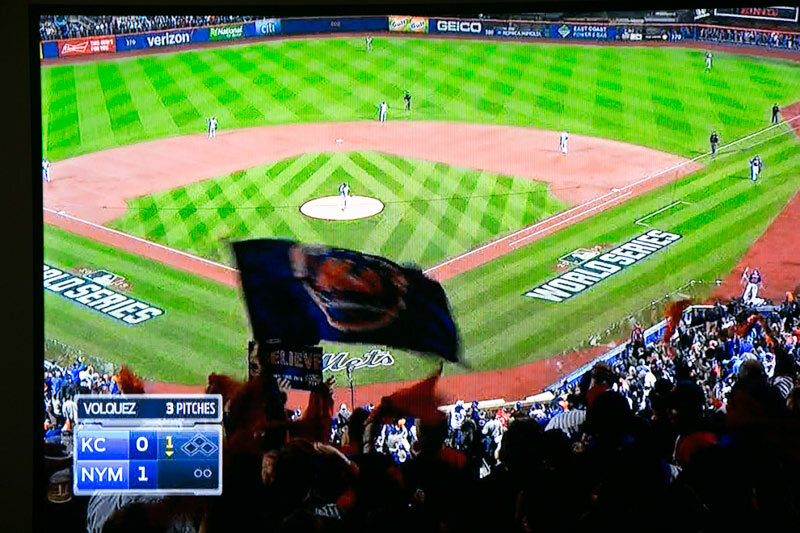 After Curt Granderson's first inning homer, Fox-TV had a great shot of me waving my Met flag. 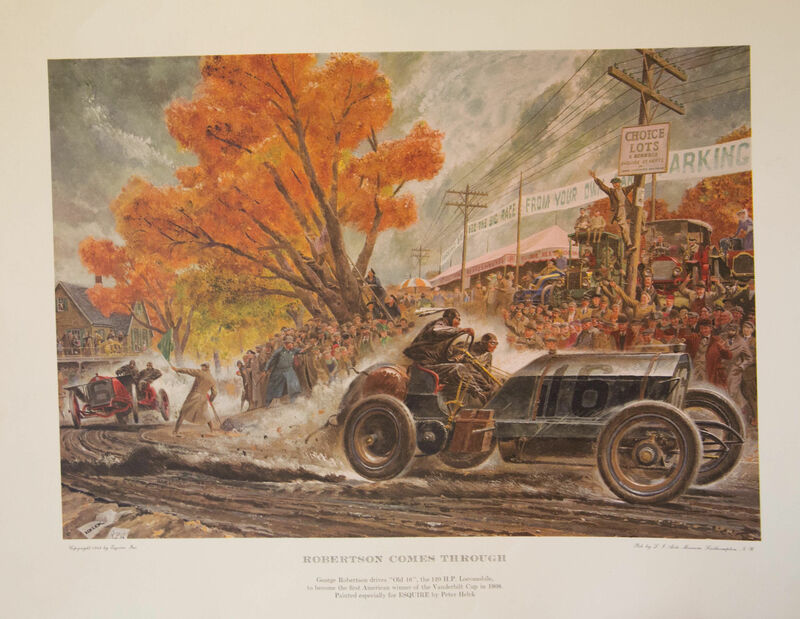 The piece is very similar to one of his works titled “Robertson Comes Through”, the #16 is obviously the Locomobile of George Robertson and mechanician Glenn Etheridge winning the 1908 race after the Chadwick broke. The other car is the #4 Big-Six Chadwick of Willie Haupt with EA Lindquist as mechanician. The other similar painting also has a sign reading “Choice lots and acreage-inquire at Hotel”.......so the location is possibly behind Krug’s Hotel, but near a hotel of some type. Parking was $5 to see the race from your car. Since Helck first visited the 1906 Vanderbilt race perhaps this was his first commissioned, or sold piece of the Vanderbilt Cup by him, and perhaps it was given to Robertson for winning the race with an American auto…..which is all a guess. Great action painting. At first glance this reminded me of the mystery below, the 1908 Vanderbilt Cup Race. So I’m betting on the winning Old 16 Locomobile (Robertson/Ethridge ) heading south on Ellison Ave after taking on the No.4 Chadwick (Haupt/Lindquist) at the Westbury curve from Jericho Tpke (background fits the description), with the spectators obliviously standing in the most dangerous spot on the course. This scene was not the final homestretch because the Chadwick finished 10th , though the painting could’ve been used that way. 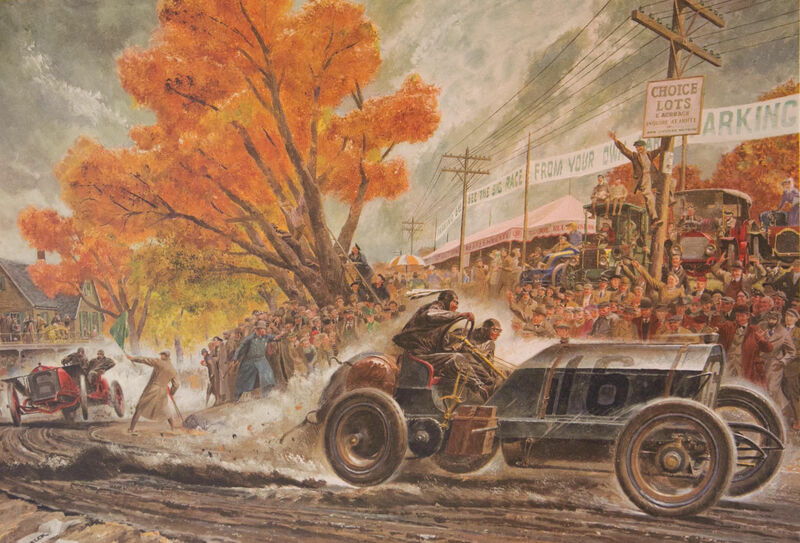 This painting may have been important for Peter Helck’s career because the image was distributed throughout the media at the time, becoming popular and iconic for depicting the first American car to win the international Vanderbilt Cup Race. Also possible that Helck gave the painting to George Robertson for his major achievement. 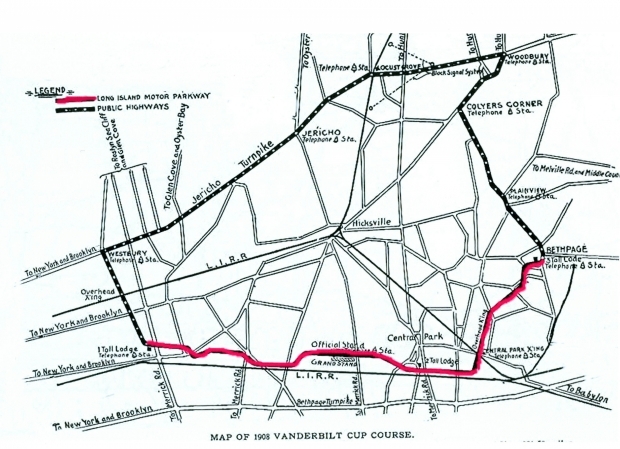 The race depicted is the Vanderbilt Cup Race held on Long Island in c. 1905/6. The location is a famous turn on the course. Peter Helck became a famous commercial artist doing ads in the Saturday Evening Post and many other magazines and this painting was one of his signature works. For years Peter Helck had a home in Boston Corners, NY, a hamlet about five miles south of Copake Falls, NY, where I live. Decades ago the Helcks came to visit my parents, driving this car, which Peter owned for years, to our residence. As we live at the top of a long hill, to this day I recall the roar of Old Number 16 rumbling up the hill to park in our driveway. What fun to see it up close! The next day my job was to remove the oil and grease spills from the ground over which the car was parked. When Peter died, I believe the car was sold to the Ford Museum in Dearborn, MI, and I believe I saw it there when attending one of the CCCA Classics in the area. Thank you for recalling these memories. Edgar. Jerry Helck, the son of Peter Helck, has told me that this painting was important for his father’s career. Can you explain why? 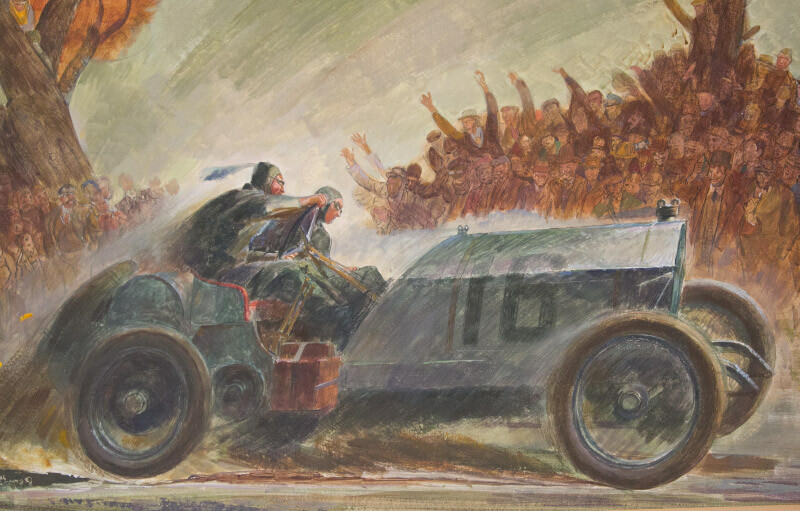 This scene, painted by Peter Helck in 1938, shows Robertson during the 1908 Vanderbilt Cup being pursued by Willie Haupt in Chadwick ‘Black Bess’. The 1944 painting by Helck for the magazine Esquire with the title ‘Robertson Comes Through’ clearly is based on this one, although the Chadwick has been replaced by the Isotta of Herb Lytle, and much more background has been added. Best location for the scene seems to be Woodbury Turn. As indicated on the painting, Helck gave it to Robertson. Maybe it did help in the purchase of the Locomobile racer, which he acquired in 1941? But I doubt if this could have had any influence on his career. I read somewhere else that the Locomobile is in the Ford Museum….but where is the !944 painting? Is it with the car?? Old 16 is in the Henry Ford Museum. Whatever happened to the painting done for Esquire in 1944? No sure what happened to the original final painting. Does anyone know what happened to the painting done for Esquire and was more than one done?